In 1967, bassist Alan Longmuir (1948 - 2018) and brother Derek (drums), Gordon Nobby Clarke (singer) and John Devine (guitar) were in a Scottish group called Saxon. They thought the moniker was too English sounding and according to legend found the group’s next name by throwing darts at a map of the United States. Why it was not a map of Scotland (being fiercely Scottish) is not clear but the Bay City Rollers were born. The Rollers were a very popular club act in the late 60s and soon snapped up by Bell Records. Their first single was a cover version of Gentry’s "Keep on Dancing." The record was produced by Jonathan King (Everyone’s gone to the moon) and entered the top ten in UK. In June 1972, Eric Faulkner (lead guitarist) joined the band and then Les McKeon (1973) replaced Nobby Clarke, and Stuart “Woody” Wood (rhythm guitar). This stabilised the quintet's line up. Their next three singles flopped but in 1974 they had a minor hit with "Remember (Sha La La La)." From this point forward the Rollers became a teen sensation in Great Britain with everyone of them dressed in plaid. The tartan clad Rollers won a song contest, sponsored by Radio Luxembourg with a song called "Mañana. " which proved popular in Europe and Israel thereby spreading their appeal. When the Rollers were not doing cover versions many of their early hits were written by Bill Martin and Phil Coulter. The writers had previously written Sandy Shaw’s hit “Puppet on a string,” and Cliff Richard’s “Congratulations.” Over the next three years the Rollers released a string of successful hits including, "Remember (Sha La La La),” "Shang-a-Lang," “Summerlove Sensation,” and "All of Me Loves All of You.” In the spring of 1975, they had become one of the biggest selling acts in Britain. Rollermania took hold of the UK as the Rollers undertook a national tour. "Bye, Bye, Baby" (previously recorded by the Four Seasons) stayed at #1 in the UK for six weeks and "Give A Little Love" topped the charts in the summer of the same year. By autumn (fall), they were number one on the US Billboard Hot 100 with "Saturday Night," a second US hit came with "Money Honey" which reached #9. A Dusty Springfield song "I Only Want To Be With You" reaffirmed their popularity in the UK. By the end of the 70s, the Rollers had lost much of their fan base and the last single to make the charts was "It's A Game" (1977). Meantime Alan Longmuir left the band because he felt he was too old for the lineup. He was replaced briefly by Irish American, Ian Mitchell, who in turn was replaced by guitarist Pat McGlynn. Alan Longmuir re-joined the band in 1978. 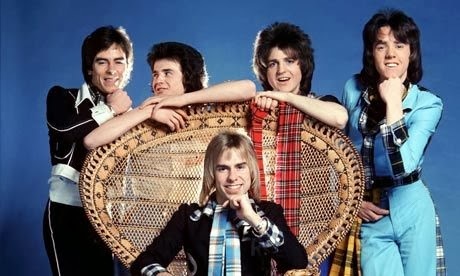 The Rollers branched out into children’s television in both the UK and the US but when their manager Tam Paton was sacked in 1979, and Les McKeown's was replaced as lead singer by Duncan Faure, a South African singer, the days of the Bay City Rollers, was over. During the 80s and 90s, there were various short-lived revivals featuring some of the original members. In 1999, the most-famous line-up of Alan, Derek, Woody, Les and Eric briefly reunited for a new LP and tour. After this date there were two touring versions of the group: Les McKeown's Legendary Bay City Rollers and Ian Mitchell's Bay City Rollers. Each group features only its titled member from the original Rollers heyday. In 2015, The Bay City Rollers, including McKeown, Stuart “Woody” Wood and Alan Longmuir announced that were reforming and would play a show at the Glasgow Barrowlands. Alan Longmuir after a short illness died in 2018 aged 70.